The following team building examples focus on how leaders can teach their team how to make decisions will minimizing risk. 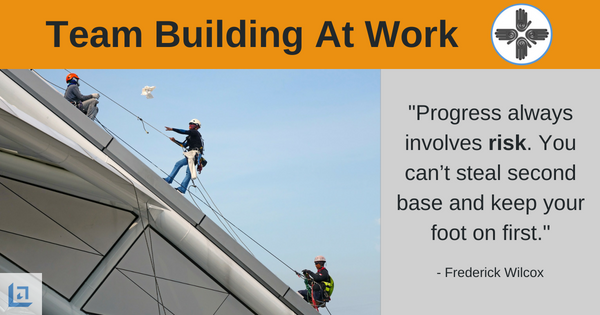 This and other important topics are covered in our free eBook, Team Building At Work. Leaders can take important steps to limit risk when they increase efforts to educate and prepare their team for the challenges they will face. It's similar to how you can best eliminate stress - by being well prepared. The fact is that you cannot 100% eliminate risk in business, but you can take steps to minimize the risk. Your goal should be to teach your team members how to walk and live in that special "zone" where their anxieties are low because they know they have the tools they need and they are well prepared to tackle the challenges in front of them. Okay, let's get more specific about how to live in the "leadership zone" using team building examples and activities with your team. First, identify what high-leverage activities you need to be putting your time and energy towards in order to achieve the results you seek. These high-leverage activities must take up the bulk of your time so that you can experience the ultimate rewards. Our team building examples below will help you with this exercise. You must instinctively shun unnecessary email, paperwork and any other "low-result activities" that can easily be addressed by others - leaving yourself and your team free to maximize the limited time you have on the activities that truly matter the most. "Progress always involves taking well calculated risk. You'll never go forward staying right where you are. So get moving!" The following activities are team building examples of "zone activities"; where the rubber meets the proverbial road: I.e., making prospect calls, developing new referral sources, marketing your product effectively, ensuring quality delivery of customer service, planning for expansion of your business, etc. The preceding examples of high-leverage activities are what makes the difference in the level of growth and success that you experience. These kinds of focused activities take a salesperson and/or organization from simply being good, to truly being great. Focus on these key areas and you immediately limit your risk of failing or plodding along in mediocrity. Use our team building examples and ideas to assist your team achieve greater results with less risk. Purpose: To quickly identify and overcome the obstacles and objections before they happen in an effort to minimize risk and increase sales results. Explanation: A customer's objection is the one major risk to closing the sale. Imagine if you possessed an arsenal of ideas that would quickly overcome any customer objection - more sales, right? Here is a great opportunity to educate your team members using a powerful Objection Clinic. Using this exercise you will assist your team in quickly identifying and overcoming the obstacles that are hindering their performance. Lead the group to quickly list their top, most common, customer objections. Use a chalkboard or flip chart so everyone can see the entire list. Make the list as long as necessary to capture the toughest and most common objections your team hears from their prospective clients. Once the list in complete, work with the team to quickly categorize the objections as many items on the list will be similar and you can use the same response to address objections that are closely related. Point out to your team that each customer objection represents the fact that the customer who has this objection does not understand the total benefit of your product or service. Makes the following points: 1. A good sales person knows their job is to educate the customer to make the best decision 2. Highly ethical sales people truly believe in their own product. Break your team into 2-3 equal work groups. Assign each group to come up with the perfect "Response", to each customer objection. Make the point that no one knows what the best response is more than the experts who sell the product. Your team members are the experts, and they do know the perfect response. They just haven't yet taken the time to craft it, but now is the time. Ask each group to share with the rest of the team their responses. Discuss each response briefly to ensure it's the very best. Let your team be the final judge - after all, they are the people who will be using this information to overcome sales objections. After the workshop is complete, provide each team member with a full list of their perfect responses for overcoming customer objections. Not only will you be surprised by the true knowledge of your sales team, they will look to you as a good leader. They will see you as an effective leader who brought them all together for the purpose of helping them solve the problems that are keeping them from being their best. You will assist them in minimizing their risk of failure by making sure they are well prepared. Over the next week, make a point of supporting your team members by quizzing them on their responses. Throw out a customer objection from time to time and ask them "How would you respond to that?" The best team building examples and exercises will continue after the initial workshop, so encourage team members to continue to pop-quiz each other. The more they practice, the better armed they will be. Repetition is the key to perfecting their responses and overcoming customer objections. Let them know that you would rather they not get it right in front of you, rather than in front of a prospective customer and lose out on the sale. "Don't let what you cannot do interfere will all that you can." Purpose: To help team members to identify the high-leverage activities that will lead to maximum results and therefore limit their risk of losing out on potential sales opportunities. Explanation: Many folks will remember one of our most famous and beloved actors - Jack Lemmon. Jack Lemmon was special for many reasons, but one thing about him that most people aren't aware of is that he had a unique ritual he used to put himself into creative state that he referred to as the "magic zone". As with many actors, what you see on the screen can be surprisingly different than what you might experience if you meet that person on the street. Their talent lies in their ability to persuade an audience to believe they are - well, whatever or whomever they want you to believe they are. Immediately before he walked on stage or came out of his trailer onto a movie set, Jake Lemmon would purposefully stop - close his eyes, take a deep breath, and say out loud (but softly under his breath) - "It's Magic Time"
Throughout his entire career he conducted this ritual as a way of putting himself in a mental state in order to perform as his best, to be in the "magic zone". During your next staff meeting, take the time to share the concept of "the magic zone". Consider leading your team through the following exercise so they too will experience the ultimate rewards of living in the zone. Identify on a flip chart 5-10 high-leverage activities, that if done continually will lead to maximum results. Top performers are highly disciplined in their sales activities, and because they are successful they spend more time in the magic zone. List those activities that if done repeatedly will guarantee in higher performance. List out on a separate piece of flip chart paper all the potential benefits of living in the zone and being a top performer. I.e., more money, security and a feeling of being in control, greater fulfillment, increased joy, increased market share, improved customer and employee retention, lower training costs, earlier retirement!, etc. Make the list as long as possible. When the two lists are complete, place the two lists side by side. Point to the "benefits" list and say to your team, "Folks, this is our motivation. We deserve all these things and more, and in order for us to experience these rewards we must (point to the high-leverage activity list) live here. This is where the rubber meets the road and these are the activities that will make the difference in our results and in our lives." This is one of our most popular team building examples and we encourage you to use it to help your team limit their risk and realize maximum success by finding their magic zone. 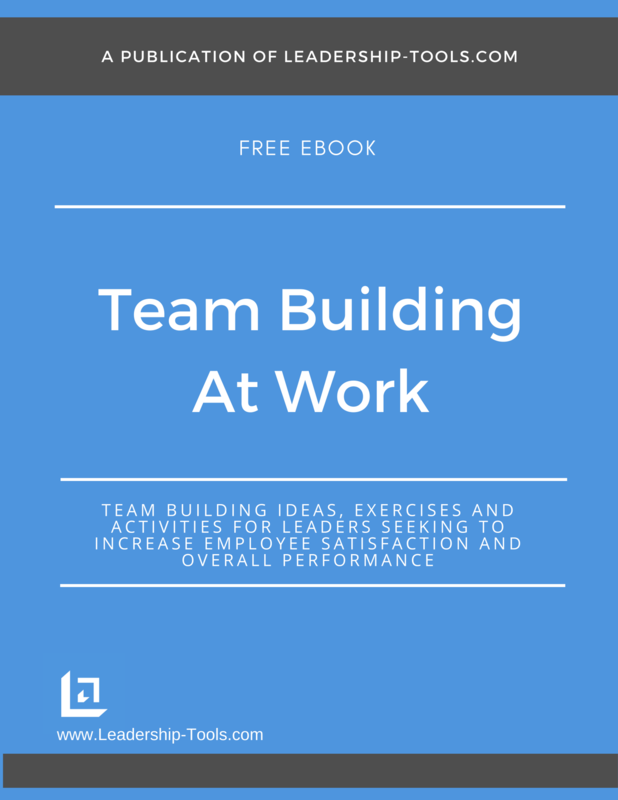 To download our free Team Building At Work eBook, providing team building examples, strategies, and activities, simply subscribe to our free newsletter. 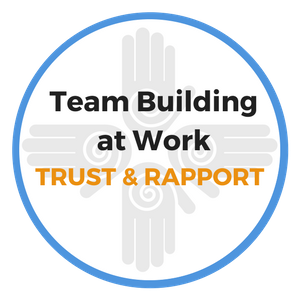 You will immediately receive a password that grants access to these team building examples and our entire leadership tools library. Your privacy is important to us. We never share or sell email addresses.